Encouraging conservatives to run for precinct committeeman has been a longtime goal of the First Lady of the conservative movement, Phyllis Schlafly. Her e-pamphlet “The Most Powerful Office in The World Is NOT The President of the United States!” is a great starting point and primer on the importance of the precinct committeeman in Republican politics. Phyllis Schlafly calls precinct committeeman and women “the most powerful political office in the world,” because they determine who gets the chance to be elected to office at every level of government. As Liberty Prize winner Dan Schultz pointed out, and I detail in my book TAKEOVER, every square inch of the United States is within a “political neighborhood,” a precinct. When you vote, your polling place is your precinct’s polling place. Each precinct has one or more precinct committeemen and each one of them was elected in the primary election. As I noted in my book TAKEOVER, there are approximately 186,000 precincts in America, and guess how you get to be a precinct committeeman? In most states it is an elected office and you become a precinct committeeman by filing and being elected in your Republican Primary Election. Now, here is the dirty little secret establishment Republicans don’t want you to know: as many as half of the Republican precinct committeeman slots, on average are vacant. Conservatives have the power and the numbers to take back their government from the current crop of officeholders who seem hell-bent on ignoring the strictures of the United States Constitution and foisting socialism upon Americans, but to do so we conservatives have to get limited government constitutional conservatives into leadership positions at the state and national levels of the Republican Party. And the way to do that is to get limited government constitutional conservatives elected to be Republican precinct committeemen. 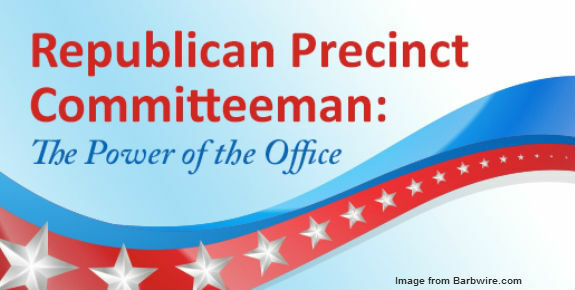 If you know someone who is a real star volunteer for one of the conservative presidential campaigns you should encourage them to get involved in the local Republican Party committee as a precinct committeeman. If your local Republican Party leaders are establishment Republicans, or if they are friendly, but ineffective, now is the time to make the case for new leadership. In Arizona, where Dan Schultz is a precinct committeeman, to get on the ballot, the candidate for precinct committeeman had to get ten signatures from Republicans or independents in the precinct. That’s it. Ten signatures. Schultz says it took him about forty minutes to get the signatures—the Party gave him a “walking sheet” for his precinct that told him in which houses Republicans and independents lived. In some precincts, the precinct committeemen only had to get three signatures. Every state has a different system. Some, like Arizona and Ohio, elect the leaders in their precincts. Other states require meeting attendance and dues. None of the requirements are onerous. Why have I never heard about this, you are probably wondering? And more important, why have you never heard about this before from your local Republican Party? Dan Schultz says that it is because virtually all Republican incumbents, including many who profess to be conservative, are terrified that you and other conservative Americans will figure this out and replace them, too, because they have not fought hard enough to preserve your liberties. They are terrified a more principled conservative adversary might get the backing of a majority of precinct committeemen in their district and state and throw out the incumbents. Like the new, conservative grassroots Tea Partiers and 9.12-ers did in Utah in 2010, denying incumbent senator Robert Bennett the primary nomination by keeping him off the ballot and endorsing boat-rocking senator Mike Lee at the Utah GOP state convention. In 2012 Indiana incumbent establishment Republican Richard Lugar was opposed by over half the Republican county chairs in the state, and likewise lost the primary. What’s more, precinct committeemen—and only precinct committeemen—get to vote in the party elections that determine the leadership of the party. That means the way to get rid of ineffective Republican Party leaders, like Republican National Chairman Reince Priebus, is to start right in your neighborhood by running for precinct committeeman. Here are some quick numbers to let you know what an achievable goal this is. Think of the thousands of conservatives who have been turning out for rallies and events for the outsider candidates for President. If there are 186,000 precincts in America, and we elected 100,000 principled conservative Republican precinct committeemen across the country, conservatives could take control of a majority of the GOP state committees. And if we did that, we could then elect a majority (85+) of principled conservatives to the 162-member Republican National Committee, giving conservatives control of the RNC for the first time in the modern era. With control of the Republican National Committee we conservatives could put an end to the feckless RNC leadership that set-up the disastrous CNBC Republican debate, called for amnesty for illegal aliens as part of their “autopsy” of their 2012 defeat and has done everything possible to alienate conservatives and break-up the coalition of cultural conservatives, economic conservatives, national security conservatives and limited government constitutional conservatives that delivered them the historic 2010 and 2014 wave victories. It’s the Primaries, stupid! And the most important office on the ballot this primary election just may be precinct committeeman in your precinct. If your precinct has a vacancy, a RINO or an ineffective precinct committeeman I urge you to go to your local elections office and pick up the paperwork to file TODAY. See my recent column, "It's the Primaries, Stupid: Have You Filed For Office Yet?"